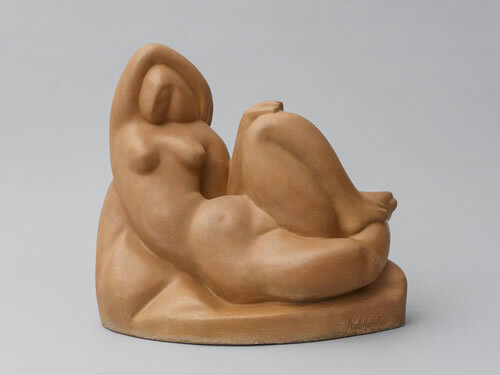 Archipenko, a Ukrainian-born artist who had moved to Paris in 1908, lent four plaster sculptures to the exhibition, including Salomé (1910), Négresse (1911), Le Repos (1911), the six-foot-tall La Vie Familial (1912, destroyed during WWI), as well as five drawings (1912). The Armory Show was the artist’s first opportunity to exhibit in America and although his works were shown in New York, Chicago, and Boston, none of his sculptures sold from the exhibition. Alfred Stieglitz, however, recognized this unique opportunity to purchase the artist’s work and acquired all five of his drawings. The four sculptures that Archipenko displayed reflected his interest in cubism and his adoption of a simplified sculptural vocabulary inspired by the “archaic” and “primitive” arts of ancient Egypt, Assyria, Greece, and Africa. Unlike his contemporary Pablo Picasso, who often reconfigured his subjects by breaking down solid forms into interlocking angular planes, Archipenko instead maintained the wholeness of the human body, choosing to exaggerate, rather than fragment, his figures’ anatomy. It was precisely these formal modifications that led Pattison to dismiss Archipenko’s sculpture, seeing in his work disfiguration rather than innovation. Others, however, responded positively to his aesthetic, celebrating the original and elemental quality of his work.